Watch Brent Macaffer speak to CollingwoodTV about his shut-down job on Richmond skipper Trent Cotchin in the 38-point round four win. Watch Brent Macaffer speak to CollingwoodTV about his shut-down job on Richmond skipper Trent Cotchin in the 38-point round four win. 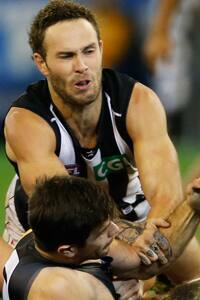 Brent Macaffer was hot on Trent Cotchin's hammer on Friday night. Sitting at the "crossroads" at the end of 2011, Brent Macaffer has turned his career trajectory on its head to become one of the most effective taggers in the competition. Macaffer played a crucial role in the Magpies' 38-point win over Richmond at the MCG on Friday night, limiting Tigers captain Trent Cotchin to just 13 disposals and laying 11 tackles in a committed performance. It was Cotchin's lowest possession tally since round six, 2010, and followed a stand-out performance on Geelong star Steve Johnson the previous week. "With (Brett) Deledio being out, we knew that Cotchin was their best player and their leader. So if we could nullify his impact around stoppages it would go along way to us winning the game," Macaffer told AFL Media. Vote for your top three players in Collingwood's 38-point win to help decide the winner of the Magpie Army Player of the Year Award. Macaffer's evolution as a footballer began at the end of the 2011 season. Nathan Buckley had taken over the coaching reins from Mick Malthouse, and a new set of standards were demanded from those at Collingwood. "Caff was at the crossroads at the end of 2011," Buckley said. "We sat down and had a heart to heart. I thought he'd just dropped off a little bit in his professionalism through 2011 and he wasn't favoured and didn't play as much footy. "He's made a real shift and decision to take this profession as far as he can." The torn ACL that Macaffer sustained in the NAB Cup in 2012 may have wrecked his season, but it steeled his resolve to break back into Collingwood's best 22. Towards the back half of 2013, Macaffer began to fill that all-important negating role for Buckley, but he has taken it to another level this year. "His concentration's been huge against the best ball winners in the competition, and he's getting better and better at it," Buckley said. "It's the strength of his character that's getting it done and his commitment to his craft. "He's now seeing something he can own and something he can contribute to the team with, and he's running with it." Buckley tells Macaffer early in the week who he'll be running with on game day, giving the Magpie stopper plenty of time to go through vision with midfield coach Scott Burns and fellow assistant coach Robert Harvey. Macaffer identified Cotchin's work around the clearances as pivotal to stopping the source of Richmond's scoring flow. In a nod to his efforts, the Tigers skipper managed to win just three clearances on Friday night. However some, including Carlton premiership coach David Parkin, criticised Macaffer for using "illegal tactics" on Cotchin. The Magpie admits he treads a fine line. "It's difficult. I got pinged for a couple out there that I thought were a bit touch and go, and thought I should've got a couple as well," he said. Buckley was asked post-match whether it was Macaffer's finest performance. In typical Buckley style, he flashed a wry grin. "He's had some good ones, but he's getting better week by week," the coach said.